Watermelon is a summer favorite here on the homestead. Such sweet and delicious goodness, and so refreshing on those hot, summer days. Watermelon is one of those fruits (like so many) that tastes significantly different when fresh and in season. For this reason, we enjoy it as much as we can over the summer and then preserve extras for that sweet goodness throughout the year. 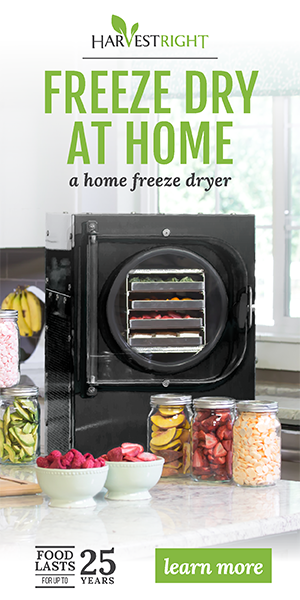 The fruit is carefully freeze-dried or dehydrated. We don’t want to waste that good rind, however. The rind is loaded with nutritional benefits and tastes amazing when pickled. Often overlooked, watermelon rinds contain potassium, vitamins A and C and 1 percent of the vitamin B-6 you need daily. Additionally, the rind contains a compound known as citrulline which is powerful antioxidant that converts to arginine, an amino acid vital to the immune system, heart, and circulatory system. Pickled Watermelon Rinds were a special favorite of my Grandpa Olaf. Grandma would lovingly make them for him each summer and he would pull them out on special occasions. The recipe is very simple, yet takes a couple days so the rinds can be soaked, brined, then preserved. For best flavor, allow your watermelon pickles to sit for a couple weeks after canning to fully develop the flavors. Day 1: Cover watermelon rind with salt and 1 gallon of water, stirring to dissolve salt. Let stand 12 hours or overnight. Day 2: Drain and rinse rinds. Transfer to a large stockpot and cover with about a gallon of fresh water. Bring to a boil and cook until tender. Drain and set aside. Tie spices in a spice bag and combine in a large stockpot with remaining ingredients. Bring to boil. Reduce heat and simmer 10 minutes. Add rind, simmer an additional 45-60 minutes until rinds are transparent. Remove the spice bag. Pack hot rind into hot jars, leaving ¼ inch headspace. Remove air bubbles, wipe rim, and secure lids. Process 10 minutes in a waterbath canner.